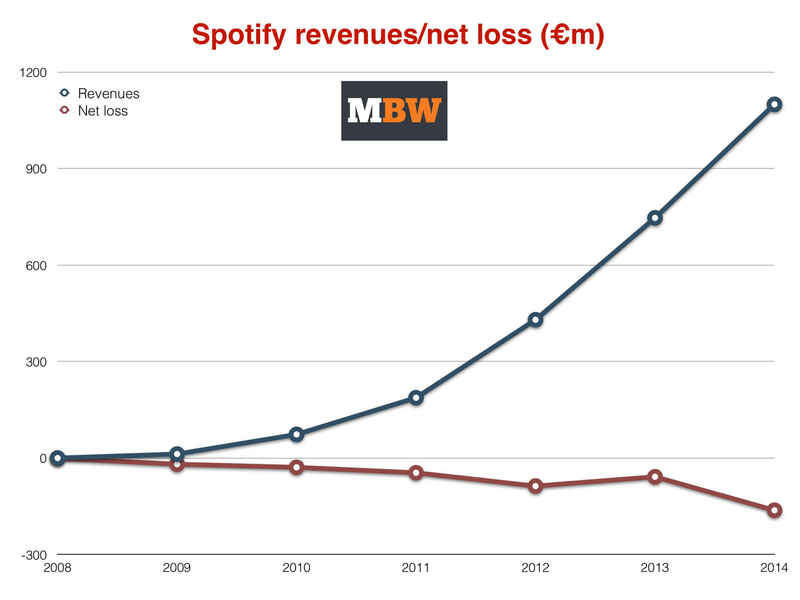 Spotify’s €1.08bn revenue haul in 2014 will have given Daniel Ek plenty of reason for cheer. That is, until he saw the bill for his company’s annual costs: €1.25bn. The gap between the two resulted in a €165m operating loss in the year, and a €162m net loss – prompting Spotify detractors to once again question whether the Swedish business will ever be able to turn a global net profit. It’s certainly true that at Spotify’s current pace, its costs are growing at a faster rate than its revenues. 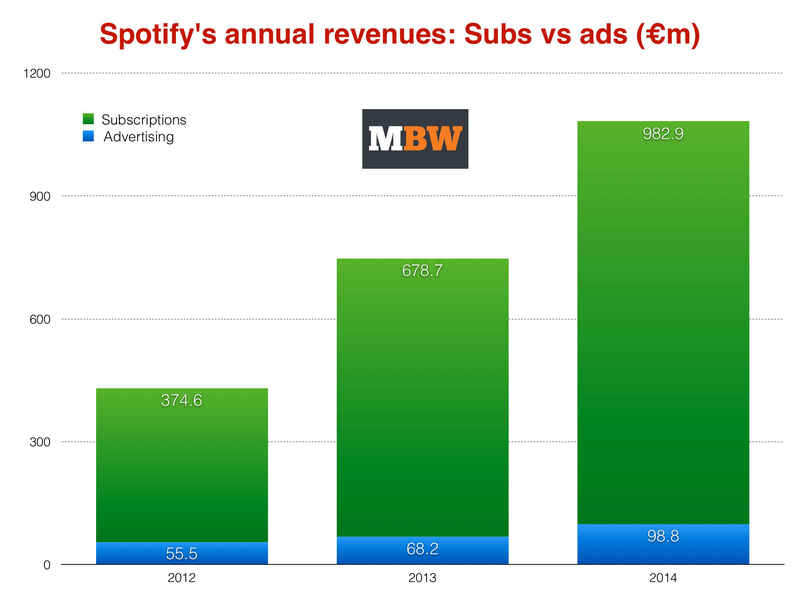 From 2013 (€838m) to 2014 (€1.25bn), Spotify’s outgoings jumped 49%. In the same period, its income leapt up from €747m to €1.08bn. Impressive, but that’s a 45% rise: it doesn’t take an economic sage to realise that when your revenue growth is being outpaced by your costs, profits are never going to come a’knocking. 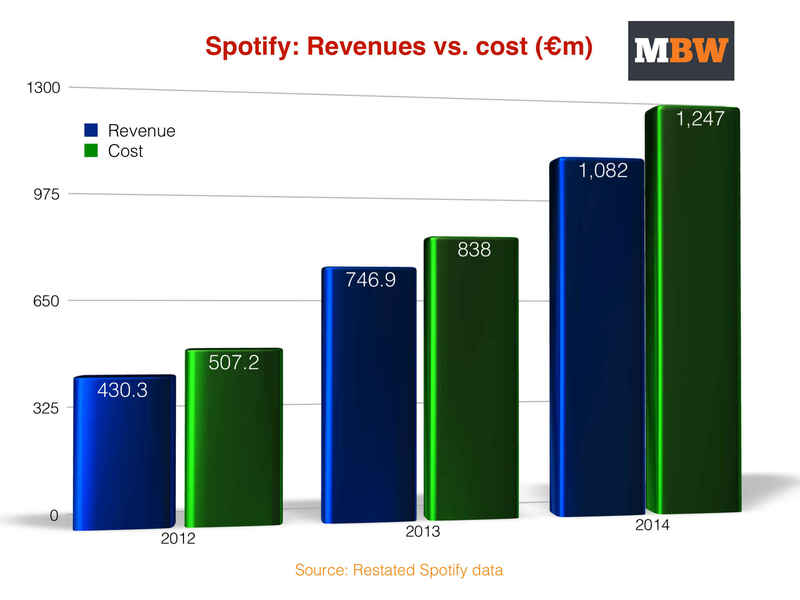 But much better news could still be round the corner for Spotify, according to MBW analysis. It’s just going to have to change one of three fundamental elements of its business model to get there. This is the one possibly for Spotify that the music industry will not want to countenance. Yet the fact remains that Spotify’s ‘royalty & distribution’ payout is the main reason for its whacking great cost base each year. Reducing it would be a huge boost to the service. Spotify famously claims to pay around 70% of its total revenues to music rights-holders across publishing and recordings as royalties. 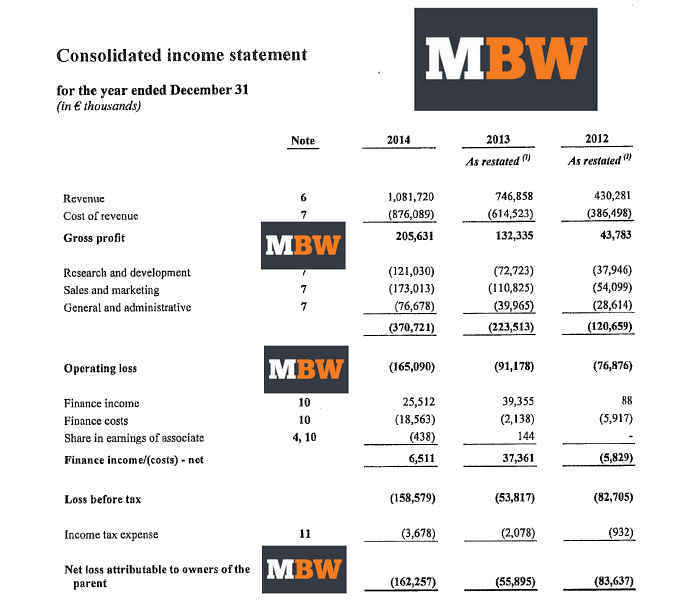 Applied to 2014’s revenue figure of €1.082bn, that 70% equates to €757.5m paid out as royalties. However, Spotify’s total ‘royalty & distribution’ figure was €882.5m. Which begs the question: where does this extra €125m come from? Spotify’s annual results, filed in Luxembourg on Friday and obtained by MBW, gives us a big clue. 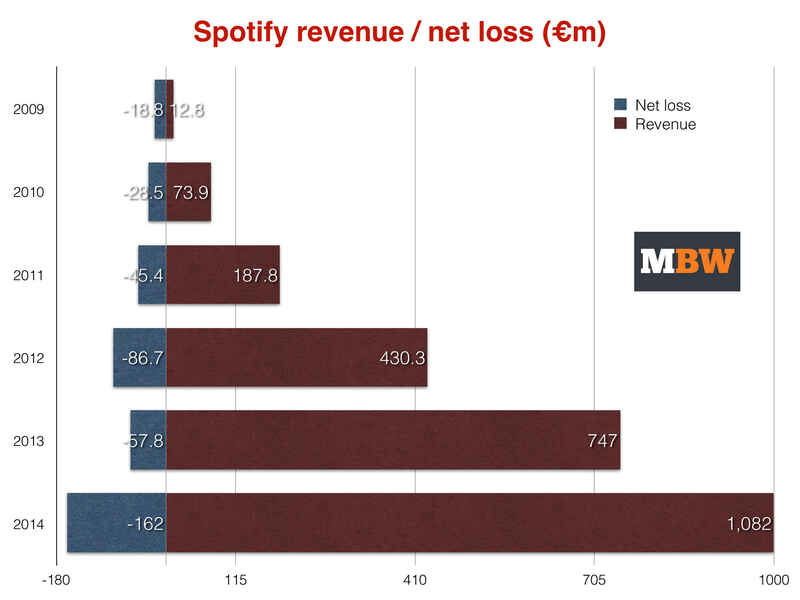 ‘Cost of revenues’ – which covers Spotify’s payment to music companies – totalled €876m, or 81% of overall revenues. This sum encompasses royalties alongside customer service, payment processing and equipment costs. Could it also be hiding tens of millions in one-off advances paid to record companies and publishers? A sub-section of Spotify’s 2014 results confirms that its FY2014 ‘Cost of revenues’ included €146.5m in ‘accrued fees to copyright holders’. It explains: ‘The Group has certain arrangements whereby royalty costs are paid in advance or are subject to minimum guaranteed amounts. An accrual is established when actual royalty costs to be incurred during a contractual year fall short of the advance payments or the minimum guaranteed amounts. The Group also has certain royalty arrangements where it would have to make additional payments if the royalty rates were below those paid to other similar licensors (‘most favoured nation’ clauses). An accrual is recognised when it is probable that the Group will make additional royalty payments under these terms. Interesting to note that Pandora’s ‘content acquisition costs’ in its FY2014 munched through just 48.5% of its total revenue ($446.4m vs. $920m). – a percentage it argues is so high that it’s crippling its business. By contrast, Spotify’s total €882.5m ‘royalties & distribution’ payout amounted to a scary 81.5% of its total revenue in 2014. It would have needed to reduce this payout to €720.5m in order to have broken even in 2014 – equivalent to 66.6% of Spotify’s total revenues. Even that, though, would still represent a far more generous payment to music rights-holders than Pandora. Meanwhile, if Spotify had decided not to spend any money on sales and marketing last year (not a wise move, obviously) yet somehow grew at the same rate, its €173m saving would have been enough to give it an €8m operating profit. If Spotify was dedicated/forced to keep its current ‘royalty & distribution’ costs at the same level, then it’s probably going to have to cut its spending elsewhere to become profitable. In 2014, the company’s revenues increased 44.5% to €1.08bn, while its royalty and distribution costs jumped 46% to €882.5. That left it just €197.5m to spend on all other outgoings before plunging into the red. The good news: if this growth trajectory continues, Spotify’s spare change after payments to rights-holders will continue to get bigger. Which all means that if (and it’s a big if) Spotify can somehow freeze its costs outside of royalty/distribution payments, then, soon enough, it’ll be laughing. 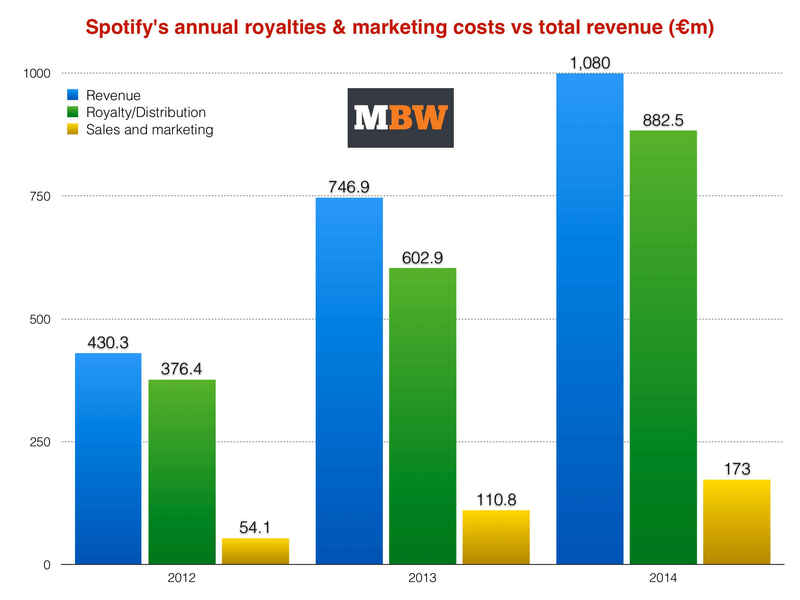 Outside of royalty/distribution, Spotify’s total costs in 2014 stood at €364m. If the firm could freeze those costs – across outgoings like advertising, PR, personnel and consulting fees – then it would easily be able to turn a profit in two years’ time (2016)… should its revenue continue to rise at the current rate. Of course, a spending cap is not on the agenda right now: when Apple and YouTube bring their new paid-for streaming services to town, Spotify will surely crank up its marketing machine, rather than tone it down. Regardless, if its current growth rates continue, in 2017 Spotify will have more than double its current annual post-royalty/distribution cash left to play with (€500m vs. €197.5m). Rather than cutting financial corners, it’s most likely that Spotify will want to become a profitable company the hard way: by raising its ARPU (average revenue per user) in future to the point that its large costs can’t hurt its bottom line. This is clearly much easier said than done. At the end of 2014, Spotify announced that it had 60m active subscribers – 45m free users and 15m paying a monthly subscription. Across all of these users on a blended basis, Spotify’s ARPU in the year was €18.03 ($20.16). The ARPU of premium subscribers for the whole of 2014 was €65.52 ($73). That’s significantly lower than the basic Spotify annual ARPU payout equation (€9.99 X 12 = €120) – presumably mainly due to discount teleco bundle deals. 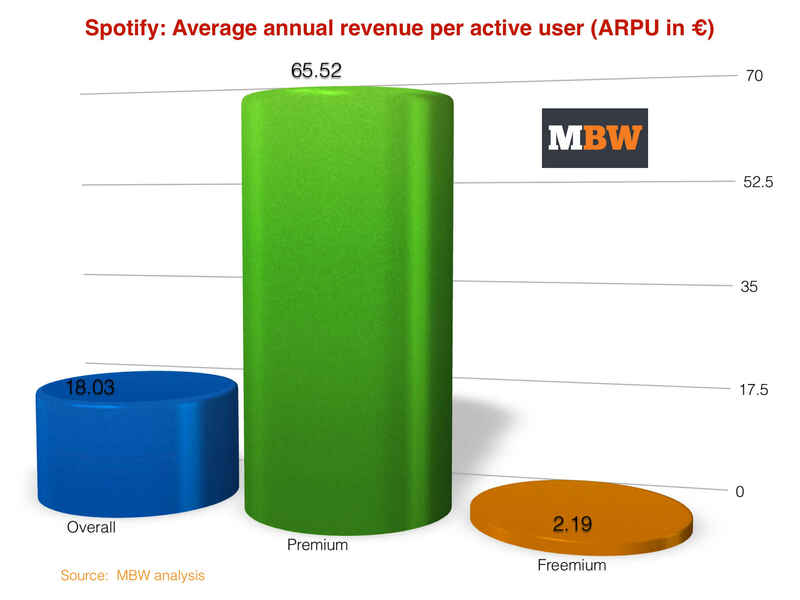 Spotify ARPU for its 45m freemium users in 2014? Just €2.19 ($2.44)… a year. In 2013… 91% of Spotify’s income came from premium subscribers. In 2014… 91% of Spotify’s income came from premium subscribers. This simply won’t do for the music industry. Of course, some rights-holders will suggest that if Spotify is going to cut its outgoings, it should focus its fiscal scalpel on the least obviously rewarding part of its business: freemium. Daniel Ek would counter that the value of his ad-funded tier is very hard to quantify – because without it, millions of users simply would never migrate to paid-for Spotify. If Spotify isn’t going to put a cap on its costs elsewhere, its options for profitability are twofold, and neither is a walk in the park: (i) it either needs to convert a higher percentage of its users to premium – a ratio which remained worryingly static in 2014 – or (ii) it simply needs to make much more money per user from advertising. By increasing the annual ARPU of free users by just €3.60 in 2014, Spotify would have brought in a further €162m… enough to completely wipe out its net loss in the year. Or to put it another way… if Spotify’s current free user base just paid €1/£1/$1 each every three months, it would be a profitable company today. Some will suggest this gentle raise in payment can be achieved with a cheap ‘snacking’ or ‘pay as you go’ subscription tier for more casual Spotify users – those put off by a €9.99 monthly premium price. Before moving down that road, Spotify will probably attempt to sell more ads, better, in order to make up the shortfall. These may very possibly take the form of video ads on a new YouTube-esque platform expansion.